Atelier Mourlot was established in 1852 as a printer of fine wallpaper in Paris, France. By 1914, Jules Mourlot expanded the reach of the shop to printing illustrated books and posters for art exhibits and national museums. Fernand Mourlot took over Atelier Mourlot after the death of his father, Jules, and transformed the field of color lithography and became the largest printer of lithographic posters. Fernand Mourlot breathed life into the printmaking industry by inviting modern masters such as Pablo Picasso, Marc Chagall, Georges Braque, Joan Miro, Henri Matisse, Fernand Leger, and others, to come to his shop and learn the craft of printmaking. The great artists took him up on the offer, and proceeded to work with artisans and print makers at Atelier Mourlot to create lithographic masterpieces. Atelier Mourlot was also the place where the art poster gained fame. Many of the modern masters that Mourlot partnered with would be commissioned to create posters for either their own exhibitions, or other art exhibits. Matisse’s first poster with Atelier Mourlot was created in 1937 for the Maitres de l’Art independent exhibition at the Petit Palais. He was so pleased with the outcome (though notoriously critical during the process) that he worked with Mourlot many more times. Pablo Picasso is one of Mourlot’s most famous collaborators. The story goes that he chose Atelier Mourlot because their shop was heated, but more likely it was on the recommendation of Georges Braque. 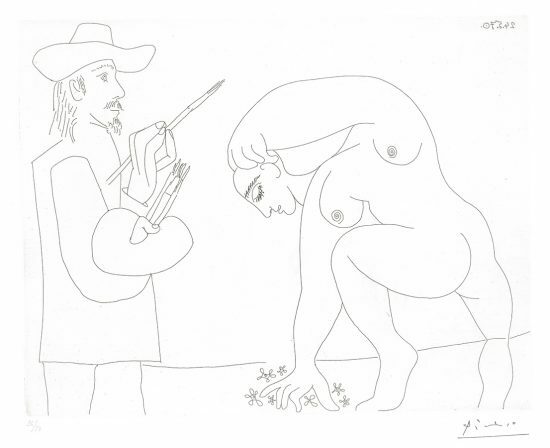 In 1945 Picasso entered Atelier Mourlot and began a period of furious lithographic production. He would arrive at the studio at 9 in the morning, and stay until 8 at night when finally, someone had to politely ask him to leave. During this time, Picasso experimented heavily with the medium – breaking all the rules and creating masterful works of art. In 1967 the atelier expanded to New York City, where they maintain Galerie Mourlot (est. 1991) to this day. In New York, collaborations continued with contemporary artists such as Roy Lichtenstein and Alexander Calder. Hults, Linda C. The Print in the Western World: An Introductory History. Madison: The University of Wisconsin Press, 1996. Mourlot, Fernand. Art in Posters: The Complete Original Posters of Braque, Chagall, Dufy, Léger, Matisse, Miró, Picasso. Monte Carlo: Andre Sauret, 1959.